HEART OF STEEL comes to Next Stage! A new full length musical from Wesley J. Colford debuts in Toronto at the 2016 Next Stage Festival! 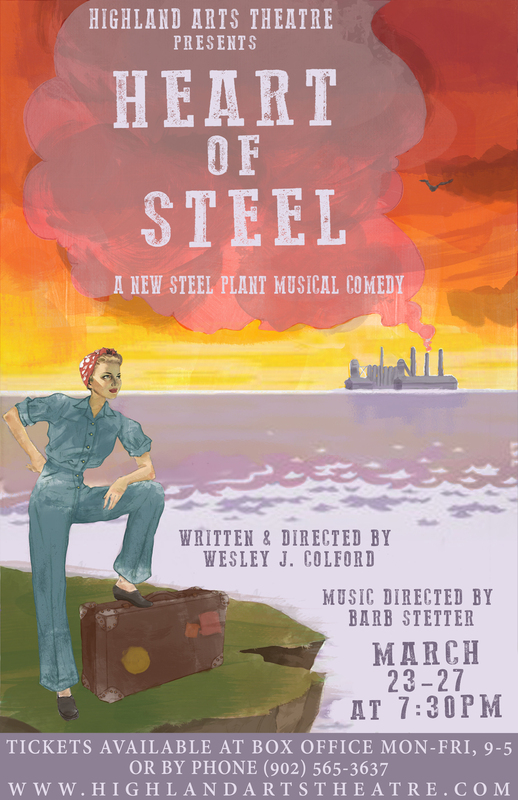 This war-time musical comedy about women taking over work at the Sydney Steel Plant premiered at the Highland Arts Theatre March 23rd, 2015 and will come to Toronto with a new cast and creative team, running January 6th-17th. "Next Stage is the perfect place to see this show develop further. It's had an amazing run in Sydney and stands to only get better with more time, energy, and a fresh outlook. Lots of changes will be happening over the next months, but it couldn't be more exciting!" The production will take place at the Factory Theatre Mainspace January 6-17, 2015. The year is 1943. The Sydney Steel Plant is in full swing, providing half of Canada's steel for the war efforts, but WW2 is far from over. The boys are overseas, and it's up to Cape Breton's female force to hold the fort! A lovable cast of outrageous characters that will put a smile on your face and a tune in your heart. Featuring an original score that mixes traditional East Coast folk with '40's swing and boogie woogie. Heart of Steel is sure to steal your heart! Auditions will be held Oct. 14 & 15, 2015 in Toronto, ON. Check back soon for more details!